Pioneers in the industry, we offer handheld refractometer from India. We are engaged in offering an extensive and commendable range of Handheld Refractometer, which is available with us at highly reasonable prices. These offered products are available in a wide variety of models and specifications to choose from. Further, we have manufactured these products under the direction of our professionals using premium quality raw material and high end technology. We are engaged in offering an extensive range of Refractometer, which is available in the model of RSRT-1, which is combined with sugar scale 0 to 95%. 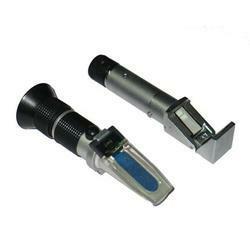 These Handheld Refractometer are use to measure the extent to which light is bent (i.e. refracted) when it moves from air into a sample. Further, Refractometer also helps to confirm the identity of a sample by comparing its refractive index to known values.